DTS announced today that it has acquired Neural Audio and a team of Creative Labs Advanced Technology Centre, heralding a full-scale move into the PC, automotive and mobile markets. 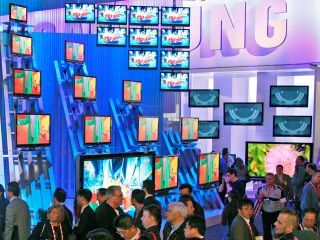 In an exclusive interview with TechRadar at CES 2009, DTS President and CEO Jon Kirchner admitted, "Our primary focus over the past few years has not been the internet or YouTube. We're now increasingly focused on PC and mobile." "Dolby is doing roughly $200m a year with PCs – it's 40 per cent of their business. Our PC business today is about 5 per cent." "I don't think we've forgotten about quality. I just think we're facing a generation that needs quality and a few other things," he added. DTS is heavily involved in the Blu-ray format and Kirchner is the first to sing its praises: "We're intensely focused on maximising our position as a mandatory part of the Blu-ray standard." "Blu-ray is more than an optical media format, it's a platform. And with downloadable content and Digital Copy, it really is a new paradigm for video," he gushed. But now DTS is eyeing Dolby's desktop presence. Kirchner says, "DTS is in a state of transition. Quality versus convenience didn't win but over time, consumers will embrace that quality and DTS will expand outside the living room." "Our priority is the PC business, largely because Blu-ray will begin to penetrate enormously. We'll be opening a research branch in Silicon Valley that brings a tremendous amount of PC experience." On its relationship with Dolby, Kirchner talks tough: "You're not going to see a hell of a lot of cooperation with Dolby. We occupy the same space, in Blu-ray and other areas - but we don't define ourselves by that competition." The company is also moving away slightly from its audiophile roots, with less emphasis on multi-channel home cinema systems, Kirchner revealed. "DTS-HD Master Audio can handle 2000 channels of sound but the idea that someone is going to put even 13 or 15 channels of sound hard-wired into their walls, well, let's just say it's not going to be mass market," said the DTS boss.